Constant fatigue and dry mouth in the morning makes the rest of the day feel like an uphill battle. If you think you may be suffering from the effects of sleep apnea, Antonio Margiotta, DMD, at Dental Artistry of Walnut Creek in Walnut Creek, California, can help. Dr. Margiotta offers a number of treatments to help sleep apnea patients, including custom nighttime mouth guards. Call or book an appointment online today to learn more. Sleep apnea is a potentially dangerous sleep disorder that causes you to stop breathing repeatedly throughout the night. These pauses in breath can occur hundreds of time in any given night, meaning your body may not receive enough oxygen. OSA, the most common form of sleep apnea, occurs when there is a blockage in your airways, typically caused by collapsed soft tissue in the back of your throat. Less common than OSA, central sleep apnea is caused by the brain’s failure to signal your muscles to breathe. This type of sleep apnea is typically seen in patients suffering from stroke, brain infection, or severe obesity. The symptoms of sleep apnea vary from person to person, but it’s important to see a doctor the moment you suspect you have the condition. When left untreated, sleep apnea can lead to sleep deprivation, heart problems, type 2 diabetes, and more. A MAD is similar to a mouth guard used in sports in that it snaps right over the upper and lower dental arches. The device uses metal hinges to push your lower jaw forward, opening up your airways to make it easier to breathe continually throughout the night. Similar to MADs, but less commonly used, tongue retaining devices are splints that hold your tongue in place to keep your airways open and unblocked. CPAP devices are the most effective treatment for moderate to severe sleep apnea, as they ensure you never stop breathing throughout the night. A CPAP blows continuous pressure into your throat, through a fitted mask, to keep your airways open while you sleep. Sleep apnea caused by enlarged tonsils, a deviated septum, or a small lower jaw resulting in an overbite may require surgery to correct. If a MAD, tongue retaining device, and CPAP machine fail to improve your sleep apnea symptoms, surgery may be your only solution. 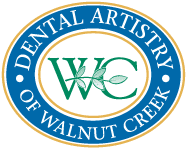 Call Dental Artistry of Walnut Creek today or book an appointment online for more information.